Don’t bother me, I’m pinning! Beautiful! All of these are “new” to me! I’m in love! I’m Roeshel and I’m a Pinterest addict too. 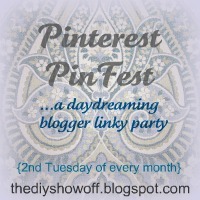 :)Thanks so much for sharing your pins in the Pinterest PinFest, Jenny! I have so many old washtubs out in my garage, and when I saw that ottoman, my radar went “PING”! Now I’m wondering if I could make one. That trailer is so dang CUTE! I love all your fantasy pins.